Agency, 29 January : The US Justice Department has filed a host of criminal charges against Chinese telecoms giant Huawei and its chief financial officer, Meng Wanzhou. The charges against the world’s second largest smartphone maker include bank fraud, obstruction of justice and theft of technology. The case could ratchet up tensions between China and the US, and impact the firm’s global expansion efforts. Both Ms Meng and Huawei deny the allegations. Ms Meng was arrested in Canada last month at the request of the US for allegedly evading sanctions on Iran. “For years, Chinese firms have broken our export laws and undermined sanctions, often using US financial systems to facilitate their illegal activities. This will end,” said US Commerce Secretary Wilbur Ross. In all, the US has laid 23 charges against the company. 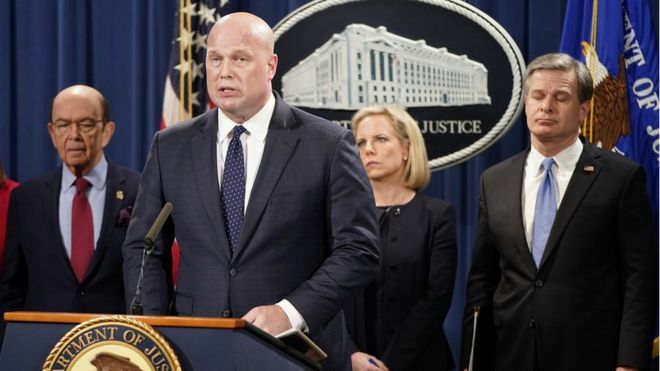 “These charges lay bare Huawei’s alleged blatant disregard for the laws of our country and standard global business practices,” said FBI Director Christopher Wray.